When disaster strikes water sources are often contaminated and the electric grid is down, meaning no clean water and no power. To get by until relief arrives, victims need drinkable water and a little bit of electricity to recharge phones, flashlights and other small devices like radios. First Few Days (FFD) is a concept humanitarian backpack that filters water and charges small devices with a pumping action. The backpack allows for easy portability in case victims are on the move or off helping during recovery. First Few Days is a backpack that can be worn during travel, evacuation or rescue missions and used to filter water for drinking. 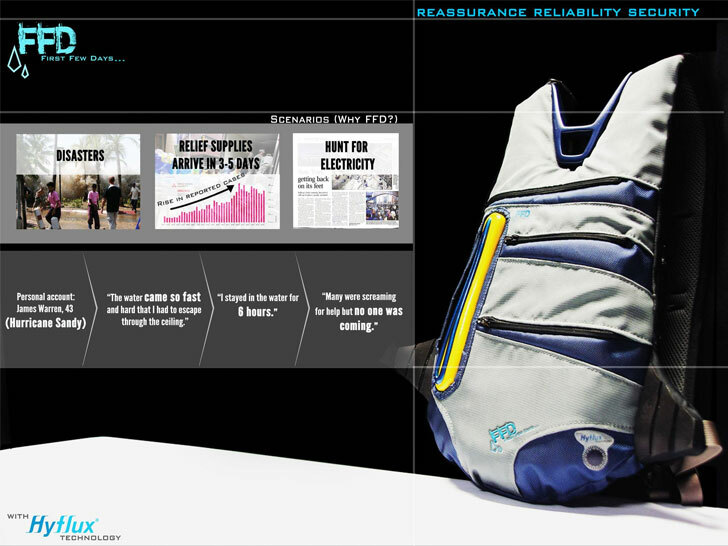 Very portable, the FFD backpack is designed also for comfort and easy of use. It is intended for victims of natural disasters as well as rescue workers, volunteers and even the military. The water filtration concept was developed to include electricity generation after watching victims of Hurricane Sandy search for outlets to charge their cell phones. Worn as either a backpack or a chestpack, FFD contains a water filtration system operated with a hand held pump. A tube with a float is placed in a water source, and a lever on the outside of the pack is pumped to move water through an activated carbon filter. Water is stored in external bottles and filled via a port on the outside of the pack. The pump action of the lever generates electricity with the help of a dynamo, which is stored in a lithium ion battery and used to charge small devices, like phones or radios, via a USB port. The back is designed to provide reassurance, reliability and security until help arrives and utilities are repaired for public use. The Singapore-based FFD team collaborated with global water company, Hyflux, who provided expertise in water filtration. This is definitely quite an impressive little device. However, it didn't seem as though much water actually went through the water filter. This may be just a prototype, or just hasn't been perfected, but most of that water was unfiltered. They should have also showed how the power works on this as well in the video.